The 2018 FIFA World Cup is fast approaching, with the opening match between hosts Russia and Saudi Arabia kicking off the action on the 14th June. FIFA world rankings: This is a ranking system for all 211 men’s national football teams. A points system is used, with points being awards based on the results of all FIFA-recognized full international matches. This isn’t the best system however and has many flaws. For example, the Brazil national team - who are widely-regarded as one of the best teams - recently dropped to 22 in the rankings. This was because they hosted the last world cup in 2014 and thus did not have to qualify through the usual qualification process. Because of this, they only participated in Friendly/Exhibition matches, which of course are not FIFA-recognized full international matches. Still, this a good place to start. Elo ratings: Next up, the Elo rating system created by Dr. Arpad Elo. The system was originally developed for FIDE, the international chess federation, to rate chess players. Its complex matrix assigns points based on the type of competition the match is being played in and takes into account the goal difference between the two sides. It’s main difference to the FIFA system is that counts friendly matches as well. If you are interested in learning more about what goes into the Elo ratings, you can here. TransferMarkt team value: This German-based site offers information on all aspects of Football, including the estimated market value of every high-profile player. They’ve put together a list of the participating countries and their team value. An interesting and quite frankly staggering side note is TransferMarkt estimates the total market value of all the players involved to be 10.64 Bill. €. Betting odds: Finally, I analysed the betting odds for the outright winner. Betting comparison site OddsChecker was used, with the most generous odds for each country taken. Once I had collected all this information, I had to somehow merge them together to determine who was the overall favorite. All of the systems were on different scales; TransferMarkt’s figures are in Euros, whilst FIFA and Elo have their own rating system and the betting odds are in fractions. I standardized each to make them comparable. In statistics, the standard scores (also referred to as the z-scores/values, normal scores or standerdized values) are the number of standard deviations by which the value differs from the mean. 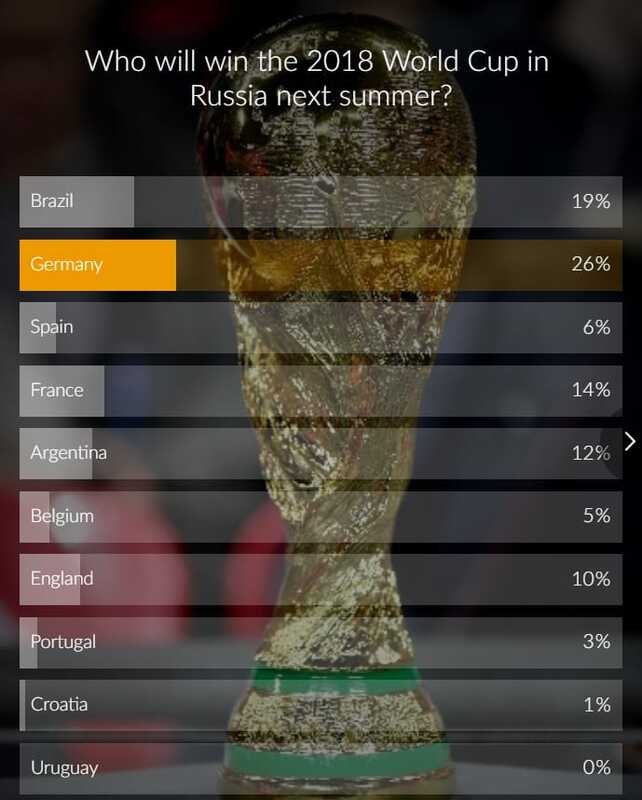 Germany come out on top, but only slightly ahead of Brazil. Following them there’s a slight gap, before Spain and France complete the top 4. The Elo ranking system and the betting odds appear the most similar, both naming an identical top five (the four mentioned above and Argentina). A few stark contrasts across the system, most notably Peru who rank 10th for z-scores in both the FIFA and Elo rankings, despite being 30th for TrasferMarkt team value. Highlighting the FIFA world ranking system drawbacks are Russia, who are 12th favourite with the bookmakers, but the second lowest ranked side overall according to their system, only ahead of Saudi Arabia. Like Brazil four years ago, Russia’s ranking will be falling due to their host nation duties at this summer’s tournament and thus their inactivity in the European qualifying stages. Saudi Arabia come out on bottom, ranking last for each system, bar TransferMarkt team value, who have Panama slightly below. The Telegraph have an extensive analysis into each team, with a poll at the end to let readers have their say on who will lift the trophy. Sporting life has not only attempted to calculate who will win the tournament, but they’ve also gone through each country and predicted at what stage they will leave the tournament. And finally, both CBS Sports and Huffington Post have produced handy articles on who American Soccer fans should be rooting for this summer, following the US team’s elimination last year.